Summary of today’s show: Fr. Stephen Linehan served for 37 years as a chaplain in the US Navy, 23 years on active duty. When he retired in 2010, he had the opportunity for a sabbatical, and decided to walk the thousand-year-old pilgrimage route called the “Camino” from southern France to Santiago de Compestela in northwestern Spain. The journey left Fr. Linehan with some lessons he shares with Scot Landry and Fr. Mark O’Connell, including that we are a pilgrim people and the less we carry, both literally and figuratively, the further we’ll go, both on the Way and in life. 1st segment: Scot Landry and Fr. Mark O’Connell talked about the Cardinal’s cabinet meeting today. They reflected on the assisted suicide referendum as well as the latest from the Catholic schools office. Scot said tomorrow is a holy day of obligation and he noted that parishes have Masses tonight and tomorrow. They discussed that people should go to Mass tomorrow and Sunday as well. 2nd segment: Scot and Fr. Mark welcomed Fr. Stephen Linehan. Scot noted that Fr. Linehan has a great voice for radio. Fr. Stephen started by saying hi to his mom. He said he was baptized at St. Paul’s in Cambridge and had first communion at St. Peter’s and they moved later to Sacred Heart in Watertown. He has two brothers and two sisters with nine nieces and nephews. His mom worked as a cook and his dad was a police officer. Fr. Stephen said he remembered thinking about the priesthood when he was in fifth grade, but the idea went away until he was preparing for college. He said he always had a gift of talking to people. He studied at St. John Seminary and ordained in 1975. He then entered the US Navy chaplaincy. During the seminary he spent one summer checking out Navy chaplaincy. That was in 1973. Ultimately, he became a Reserve officer in 1977 and in 1987 went on active duty. He’s served all over the world, starting out in Guam. He was supposed to be sent to Twenty Nine Palms in California to serve with the Marines, but got changed at the last minute. From Guam he served all over the world and retired from Spain in 2010. His favorite assignment was in Long Beach, California, which is the seaport of Los Angeles. He said Los Angeles has everything and he met some great people there. Fr. Stephen was a chaplain on the USS Forrestal, the first of the big aircraft carriers. That was on his second tour of active duty. The ship had 3,000 people and the air wing had another 2,000 people. Deployments were generally about 6 months, but they also visited ports and so they would be at sea for three to four weeks at a time. He would typically be the only Catholic chaplain. The ship would have three chaplains and the air wing might have another one. Part of their duty was to be flown from the carrier to the smaller ships in the task force to celebrate the sacraments. Sometimes they would be lowered from the helicopter on a rig. He was in the Navy for a total of 37 years with 23 years on active duty. Fr. Stephen’s first assignment was St. Mary’s in Franklin and then to St. Margaret Mary in Westwood and then to St. Francis of Assisi in Medford before going to the Navy. And then his first assignment back in the Archdiocese was at St. Margaret Mary. He said there were a number of people who remembered him in the parish.He said the major difference between the parish then and now would be the size and growth of the town, but he said the main distinguishing feature is the overall stability. He said a major part of the town’s focus is on young people. He did note that the town has aged as well, with many more older retired people living in communities within the town. Scot noted that Fr. Stephen’s predecessor was named a bishop. Bishop Christopher Coyne is now an auxiliary in Indianapolis. Fr. Stephen said Bishop-elect Deeley has also been coming to the parish which worries him that there must be something in the water. Scot asked about the difference in ministry between Navy chaplain and pastor in Westwood. Fr. Stephen said part of the ministry of priesthood is healing and reconciliation and visiting the homebound and sick and elderly has been new for him. In the Navy the community is generally younger. Today, he works with many people who are estranged and wanting reconciliation. Fr. Mark noted Fr. Stephen was in the Navy during the abuse crisis. Fr. Stephen said the effects will stay with us, but healing and reconciliation are desperately needed. Scot asked how Fr. Stephen would commemorate the events of December 7, 1941 in the Navy. He said he served in Hawaii for three years and he said there are always ceremonies, including wreath-laying events at the USS Arizona Memorial. He was working with the Marines at the time and at the Kaneohe air base, they would also have a ceremony, noting that the Japanese planes flew over that base first. 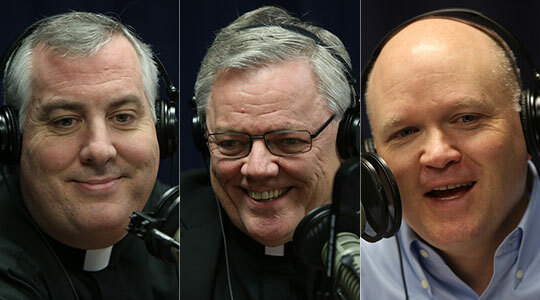 3rd segment: Scot said in an earlier show when they discussed the Martin Sheen movie The Way, he and Fr. 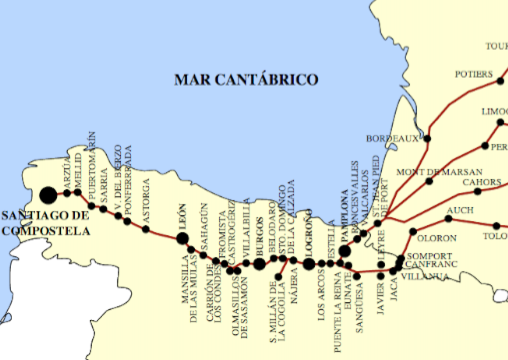 Mark talked about people who had gone on the pilgrimage to Santiago de Compestela. Scot said it is the longest active pilgrimage in the Church, because for many years people couldn’t go to the Holy Land. Santiago means St. James and the pilgrims go to the tomb of St. James in northwest Spain. Fr. Stephen said the pilgrimage began in the 800s. He said the great pilgrimage sites include Jerusalem, Rome, and Tours for St. Martin of Tours. Fr. Stephen had heard of the Camino while he was serving in Rota, Spain, and when he retired he decided to try it out. He heard from people who’d gone how moving it was. He noted that Rota was the most popular duty station in the Navy. He said they took people to Fatima and to Lourdes, but he began to look into this pilgrimage. It was while he was sitting in a cafe in Seville that he decided to do it. He said there’s a minimum pilgrimage distance of 100 kilometers or 62 miles, but the traditional pilgrimage starts in a small town in France on the other side of the Pyrenees called St. Jean Pied. Fr. Stephen hiked over the mountains over two days. He said there are many starting points all over Europe, and the tradition is you start at your front door and walk. The route he chose was 800 km or 500 miles. For some younger walkers, it talks 30 days. For Fr. Stephen they took 46 days, but walked only 36 days and rested the other ten. They did have to stop for medical care for their injuries and the hospitals gave them free care because it’s traditional not to charge pilgrims. Fr. Stephen said it’s not bad to walk. Ninety percent of pilgrims don’t train, but he likes to train and didn’t find it taxing. He said people often carry too much stuff in their backpacks. The average person can do it with a pair of shoes broken in and a light pack. He said you can go with friends or do it in a group, but you do it alone. He said it’s a great opportunity for prayer. At times, you don’t want to walk with others at time and just want to be alone. Fr. Stephen said it was wonderful. He had only purchased a one-way plane ticket and they didn’t set themselves a schedule without trying to rush it. The Camino is a paradigm of life, you have to take your time. Don’t rush it. The first day, climbing out of St. Jean Pied is tough. At one point you feel yourself walking fast, but he had to remind himself to walk at a relaxed manner. It takes a week or so to slow down and take it easy. He said people walk at their own pace, but you often reconnected with other pilgrims in the towns and at hostels and in cafes. There’s also a sense of anonymity because you may never see these people again. There is a fellowship and camaraderie. In some hostels, they have kitchens and people buy food and cook it together. He said there also pilgrim meals, say 10 euros for three courses. He noted that you burn a lot of calories every day. Fr. Stephen said he’s a history buff and loved the idea of traveling the same roads that Charlesmagne would have traveled and other famous people. The theology of the communion of the saints is very real in the pilgrimage. He said the Camino has the whole range of people. He admitted that there were times when he just wanted to throw in the towel, just like in life, but you keep on going. Keep pointing one foot in front of the next at a slow pace. Fr. Stephen said many of the cities along the way are big cities with lots of tourists, but he didn’t find it distracting. Part of the journey was to learn how to tell better stories, to become a better preacher, and to learn about himself. He talked about the spiritual symbolism of the pilgrimage. Reaching Santiago was emotional. The cathedral was jam-packed with pilgrims, many of them who have traveled by bus. The saw the famous thurifer, which is immense. It’s about four or five feet, and they swing it from one side of the cathedral to the other. Fr. Stephen talked about a pillar in the church that has been worn down by pilgrims touching it at the end of their journey. He said he feels like the pilgrimage transformed him. He said the transition from active duty Navy to parochial ministry is a transition that takes a while, so he does it while walking slow in a relaxed manner, trusting the God has a plan. It was a chance to move along, but also to meditate and to pray. Fr. Stephen said most people go during the summer, but it’s very hot. He chose to go during the fall and it was gorgeous. He’d love to go in the spring. It would look and smell different although it might be rainier. The winter is more dangerous. He left in early September. If someone wants to do it, buy open-ended air tickets and outfit themselves with the proper gear and clothes and boots. You could stay in inexpensive hostels or expensive hotels. They could spend $500 each way for airfare and spend about $30 to $40 per day. You don’t have to di it all at once. He saw guys who were doing it two weeks at a time each year for 10 years. The highest point on the Camino is called the Cruz di Ferro, the Iron Cross. It’s a huge pile of stones that was built by people carrying a rock with them to lay down there. He suggested people read up about it and all the customs and traditions. He said it would be great for all priests and seminarians to do the pilgrimage. If you carry less, you’ll go further. Think about all the stuff you drag around in life. Keep it simple. Because we are a pilgrim people. Scot said St. John the Baptist is one of the key figures of Lent and Advent and is a symbol of preparation. We’re called to prepare the way for Jesus, especially the way to our hearts. Fr. Mark said in Advent we come to God and God comes to us in a new way. That’s what John is screaming about. Fr. Stephen said the imagery of make straight his paths in the first reading is all imagery from the camino. How do we straighten out the crooked paths? The camino is a meditation on all that. How do we straighten them? With God at our side.